Saving up a significant cash savings or an emergency fund capable of holding 12 months of living expenses is a Herculean effort in of itself. Once you have managed such a feat, the next question becomes what do you do with the money? Having it sit inside a big bank account earning 0.20% interest doesn’t seem like a wise use of your funds. While an online savings account is a step in the right direction, those are only earning around 1% these days. If inflation is 3%, you are still losing money every year. Beating inflation is difficult. You could consider investing in the stock market, but picking stocks is hard and highly risky. To generate a higher percentage of growth while still limiting some risk you have three options: Certificates of Deposit, Peer-to-Peer Lending, and Rewards Checking. The least risky option to try and beat inflation with your money is to stick the it into a certificate of deposit with a reputable, FDIC insured institution. The amount of interest you can earn is dictated by interest rate policy by the government. Shorter term CDs offer the same interest rates as online savings accounts (about 1%) but lack the liquidity of a savings account. Longer term certificates of deposit generate higher interest. However, to beat inflation you would need to lock up your funds for a long time (over 3 years) to even get close to 3%. Nearly risk-free if you are using an FDIC insured bank and putting less than the FDIC coverage ($250,000) into the CDs. “Set it and forget it.” You don’t have to manage the CDs. They earn the stated interest through the term of the CD. You will pay a charge to break a CD open before the end of the term. This is usually equivalent to 3 months of interest. It is difficult to find CDs earning significant amounts of interest. The most risky option is the one that can generate the highest reward for your money. You can decide to become a lender to other people through a peer-to-peer lending service. With P2P lending you take on the role of a banker and decide to lend money to other individuals who post on why they need the money. The P2P service checks the borrower’s credit and sticks them into a risk profile. The higher the risk, the higher the interest rate you can earn. You get to pick who the money goes to. Your money is typically locked in to a loan for a term of 3 years. This doesn’t serve an emergency fund well, because you can’t call the loan before the 3 year term (although the borrower can pay it off before then). You are lending money to other individuals with no guarantee you will ever be repaid. There is a much higher risk due to the reward you can earn with lending directly to other individuals. When most people hear rewards checking account they think of accounts where you get cash back or points for swiping your debit card. There is a different type of account that many smaller banks and credit unions are utilizing to market themselves and to drive up deposits. 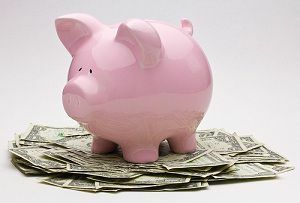 The rewards come in the form of interest on the checking account, but the rate is much higher than most saving accounts. The rewards do come with stipulations: generally you must swipe your card 10 to 12 times per month, you must sign up for and access electronic statements, the high interest rate is limited to usually the first $25,000 you have deposited, and you must have 1 direct deposit or ACH debit every month. If you can complete these relatively simple tasks, you can be rewarded with rates ranging from 2% to 4% depending on the bank. You get the interest rate of a great CD or savings account with the accessibility of a checking account. You get FDIC coverage assuming you are with an FDIC insured institution. The requirements are easy to meet. The interest rate is limited to the first $15,000 to $25,000 you have deposited (depending on the institution). You do have requirements to meet — you can’t just put the money in and forget about it. Rewards checking accounts are marketing tools designed to bring in deposits. Because of this, rates do fluctuate and rewards programs are canceled from time to time after the bank has enough deposits. You would need to seek out a different institution if yours lowers the rate or stops the program.